Flowered Up was a five-man Baggy band originating from Camden in London. After releasing two singles ("It's On" and "Phobia") on Heavenly Records, Flowered Up signed to London Records and recorded their first (and only) album A Life With Brian (1991). The band were unusual in that, musically, they resembled Madchester bands such as the Happy Mondays but, whereas almost all of those bands came from Manchester or the environs, Flowered Up came from London. After releasing two singles ("It's On" and "Phobia") on Heavenly Records, Flowered Up signed to London Records and recorded their first (and only) album A Life With Brian (1991). 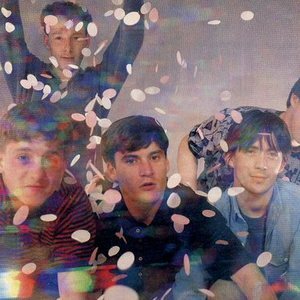 The band were unusual in that, musically, they resembled Madchester bands such as the Happy Mondays but, whereas almost all of those bands came from Manchester or the environs, Flowered Up came from London. A Life With Brian contained many of their popular live songs as well as new versions of the previously released singles. However, the album was said by many not to live up to the promise of their live performances. Not long afterwards, Flowered Up released what some believe to be their creative high point: the 13-minute single "Weekender", again on Heavenly. 'Weekender' which was released with an expensive video directed by W.I.Z. which told the story of a particularly debauched night out, was thought by many to sum up the whole 'clubbing' and ecstasy culture that had grown up in the UK in after Acid House. The debauchery hinted at in their music was not merely a pose, and after much publicised drug problems with some members of the band, and some more generally unproductive (and unreleased) studio work, the band split up. A Life With Brian has since been rereleased by London as The Best of Flowered Up and now includes the 12 inch version of "Weekender".